Seattle’s median home sold for $675,000 last month, beating an all-time high set last summer. Prices have now nearly doubled over the last five years. The Eastside and Snohomish County also set new price records. Prices are surging largely because there are fewer and fewer homes up for grabs, making competition fierce. 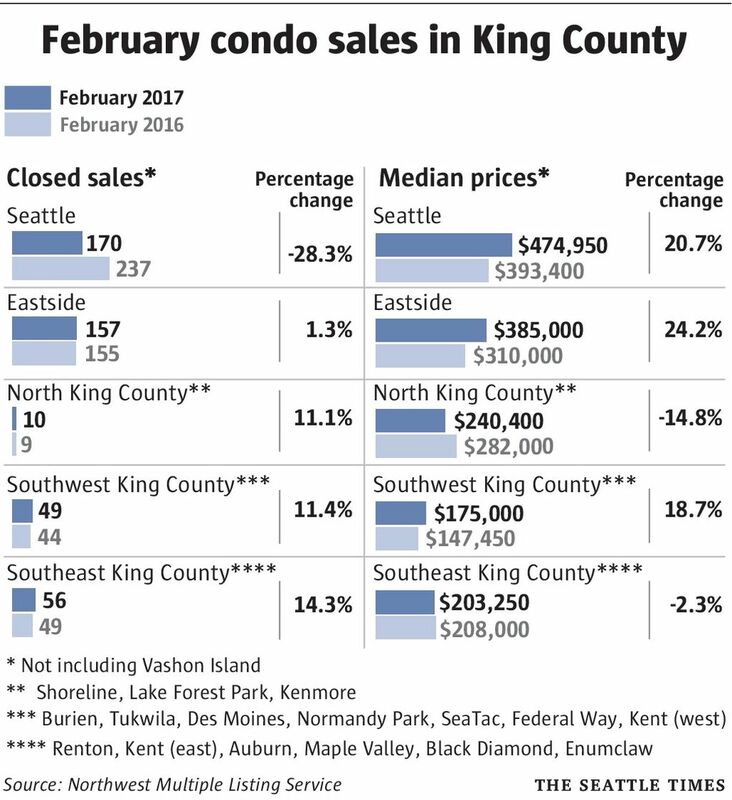 The number of houses for sale in King County is at its lowest point since at least 2000, the furthest back records are available. Michael Doyle, a managing broker for Windermere in Seattle, said he put a Ballard home on the market a couple of weeks ago for $600,000. It immediately got five offers, each over the asking price, with the winning bid topping $700,000. There were only about 1,400 houses for sale across King County as of last week, down 25 percent from a year ago, according to the Northwest Multiple Listing Service. Just two years ago, there were nearly twice as many homes for sale. When the market bottomed out in 2011, the county had six times more homes for sale than today. The dearth of listings is the result of lightning-quick sales and fewer people selling their homes than normal, often because they don’t want to have to turn around and buy another expensive house. The situation is even bleaker for condos: The number of condos for sale across the county plummeted 42 percent compared to this point last year. There are fewer than 300 condos for sale in the entire county, down from nearly 1,000 three years ago. The pipeline for new units in downtown Seattle has been drying up even as people look for more affordable options than a full single-family house. Brokers expect more listings in the spring, but that’s also the peak season for buyers. Home prices are rising faster than many prospective buyers can keep up with, particularly for first-time buyers who are already grappling with rising rents. Andy Ferris, 28, a Seattle native who rents in Fremont, is hoping to buy a house with his wife next year. They both work in tech but are still unsure they can save up enough money unless prices stop climbing. Interestingly, pending home sales in February were down 9.4 percent from a year ago, the first decline in 10 months. That decline comes as local real estate agents and mortgage bankers say they have noticed legal immigrants here on temporary visas and foreign buyers backing out of the home-buying process in response to President Donald Trump’s actions on immigration since taking office. It’s impossible to know exactly how the pullback in immigrant buyers has affected the market because no one tracks the nationality or immigration status of buyers. But the potential impact is significant: About one-fifth of the county’s population was born in another country, and the region has among the nation’s highest concentrations of foreign workers here on temporary H-1B visas. Brokers surveyed by the Northwest Multiple Listing Service said they had mixed views on the magnitude of the impact that a pullback in immigrant buyers could be having on the market. George Moorhead, designated broker at Bentley Properties, said there is a “distinct ripple being felt.” Trump on Monday signed a new executive order banning travel from six Muslim-majority countries. “We do anticipate many buyers with the H-1B visa to start cooling their interest until clarity is given to how this new policy will shake out,” Moorhead said. The rest of the Puget Sound real-estate market remains scorching. On the Eastside, home prices reached a new all-time high of $832,000, about $40,000 more than a month ago and nearly $100,000 more than a year prior. The suburbs to the north and south of Seattle saw double-digit annual increases, as well. There were pockets of home price drops, however. 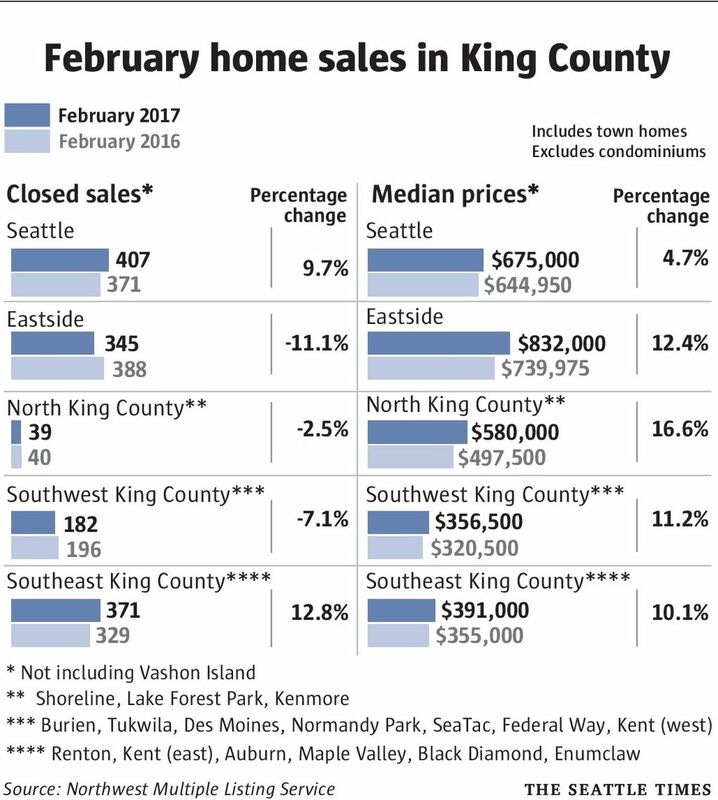 Sodo/Beacon Hill, Mercer Island, Kirkland-Bridle Trails and Enumclaw also saw cheaper home sales than in the same month a year ago. Snohomish County median home prices increased 14.9 percent year-over-year, the biggest annual increase there in 13 months. The median price of $412,500 in February marked a record for the county. Pierce County home costs jumped 12 percent to $280,000, while Kitsap County saw a 9.8 percent rise, also to $280,000. King County’s year-over-year price increase of 8.7 percent was the smallest of the four local counties for the second straight month. Outlying areas continue to see home values surge in part because of priced-out Seattleites moving away for cheaper alternatives. Residents in the Seattle metro area pay an average of $28,300 a year for housing costs in urban areas vs. $21,300 a year in local suburban neighborhoods, Zillow reported Monday, based on mortgage and property-tax costs. Both figures are about $6,000 more than the national average. And local home buyers in the suburbs get an extra 224 square feet of living space, on average, compared to urban residents.